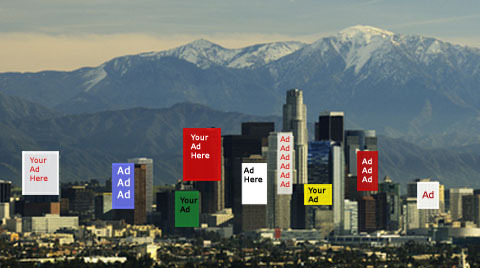 One of the articles of faith among some architects, urban design professionals, politicians and members of the real estate development world is that billboards and other kinds of outdoor advertising shouldn’t be allowed just anywhere, but have an appropriate place in limited geographic areas. Times Square, to give a frequently-cited example, and closer to home, L.A. Live and the Staples Center area downtown, Hollywood Blvd., and that short stretch of Sunset Blvd. known worldwide as the Sunset Strip. Those of us opposed to the wholesale surrender of the urban environment to McDonalds and Pepsi and the other juggernauts of corporate commercialization have said, “Fine, have your Times Square, your L.A. Live, your Sunset Strip. Just don’t replicate those places all around the city.” Knowing, of course, that replicating those areas around the city is exactly what many property owners, developers, and those who make their living in whole or part in the outdoor advertising industry want to do. Which brings us to the city of West Hollywood, which seemed to adopt an enlightened view of the issue when it decided after incorporation 25 years ago that part of the attraction of the Sunset Strip derived from its famous billboards—think the “Marlboro Man”—but that it would limit billboards and supergraphic signs to that entertainment-heavy area and strictly forbid them elsewhere. And in contrast to its big neighbor, L.A., it largely succeeded in enforcing those regulations. But now the city is on the brink of abandoning that policy, and allowing supergraphics or “tall wall” advertising signs outside the strictly limited area of the Sunset Strip. Why? West Hollywood, like almost all California cities, is desperate for revenue, and a property owner has promised a big chunk of it in exchange for the right to put up multi-story supergraphic signs on both ends of a building almost two miles away from the Sunset Strip billboards. See 1st Tall Wall Off Sunset In Offing. Other property owners, developers and those who regard the city’s visual environment as a commodity to be exploited for maximum financial gain are no doubt awaiting West Hollywood’s decision with eager anticipation.